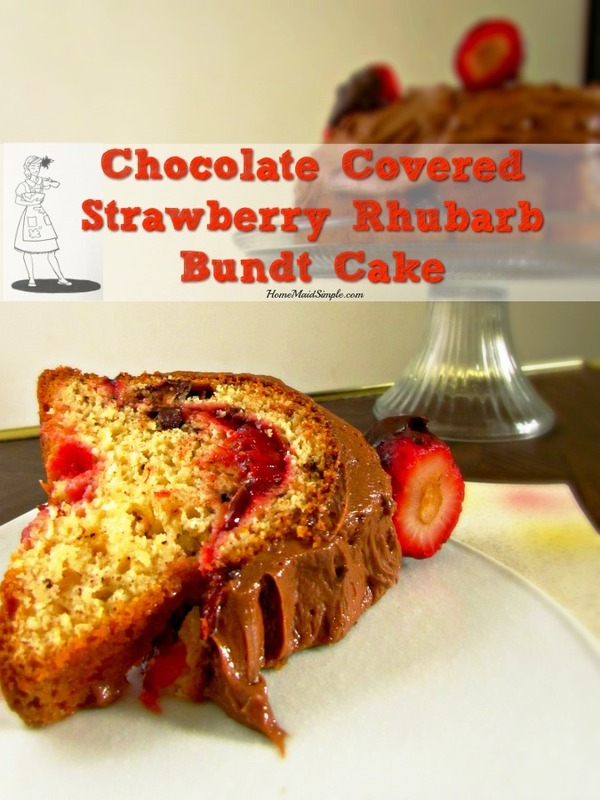 Add the flavors of spring to this decadent Chocolate Covered Strawberry Rhubarb Bundt Cake. 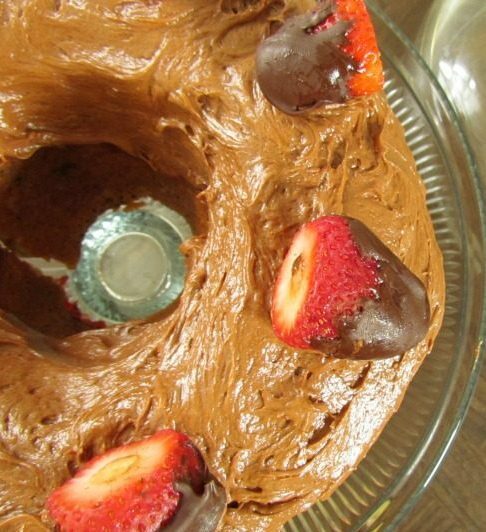 With a secret ingredient, this cake goes from good to amazing! This post contains affiliate links and I will be compensated if you click on and purchase through them. It all started when our Relief Society celebrated it’s 174th birthday back in March. As a committee, we decided to serve up bundt cakes. I thought for sure I was going to be in trouble because years ago I threw out my bundt pan because no matter what I did the cake always stuck inside. I agreed to make a cake, though and left with a few pointers for getting the whole cake out. 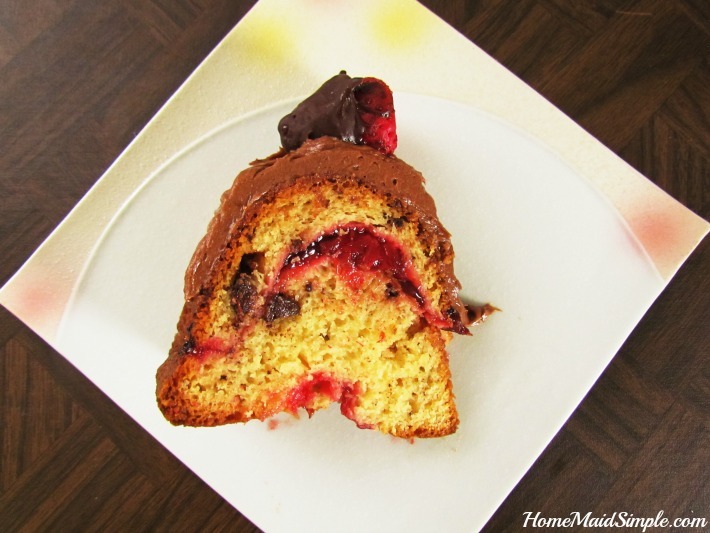 First, I hit up Pinterest and found this recipe for White Chocolate Raspberry Bundt Cake at Baked in Arizona. I couldn’t pass it up! Next, I had to find a new bundt pan . We were browsing birthday gifts for Mark at Kroger one day, when would you believe it – Bundt pans were on a BOGO free sale! Someone knew I needed to make a bundt cake, and they must have known you’d like a chance at winning one too! So make sure you scroll down after the recipe and grab your entries to this giveaway! When I flipped that cake over and it actually came out I most definitely did a happy dance and squealed like a little girl. Who knew you had to let the cake completely cool first? OK, that’s not all I did but hang on for the next tip. 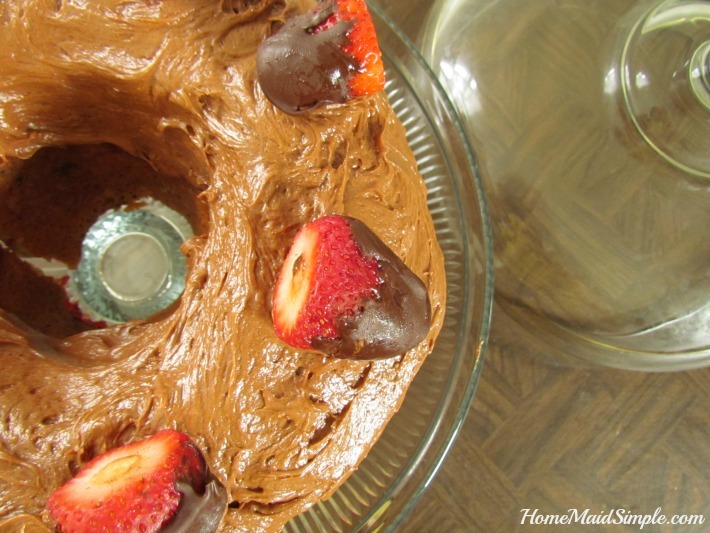 First, I have to tell you about this Chocolate Covered Strawberry Rhubarb Bundt Cake. After we enjoyed the White Chocolate Raspberry Cake, my sister in law turns to me and says “Too bad you couldn’t make it a cheesecake bundt cake”. Oh, she knows me so well! That got my wheels turning, and thanks to a not-so-secret ingredient, that’s exactly what this Strawberry Rhubarb Bundt Cake is! 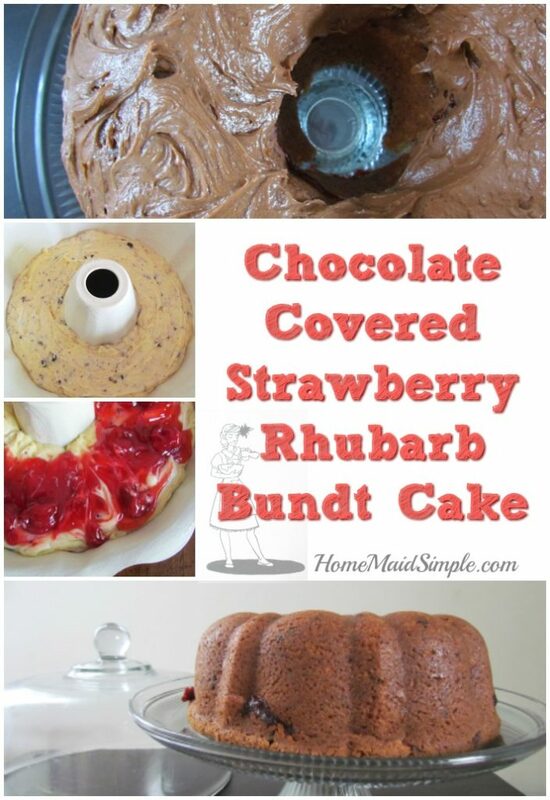 Well, at least as close as you can probably get to making a cheesecake in a bundt pan. The secret? Cheesecake flavored pudding! You must let it cool completely! I always thought just until it’s warm was good enough. NOPE! Let that cake sit for a few hours until it’s completely cool to the touch. Time to learn a little patience. Mix 1 TBS vegetable oil, 1 TBS shortening, and 1 TBS flour. Using a pastry brush, brush the mixture all over the pan, taking special care to get in all the grooves. I’ve tried finding where I got this tip from, and the video seems to have disappeared. This has worked like a charm, and so much better than greasing and flouring. Mix together cake mix, pudding mix, eggs, water, and oil. Set aside. Chop 1 cup of chocolate chips. Mix into the cake batter. Pour 1/3 batter into bundt pan. Layer 1/2 the pie filling. Repeat until cake batter and pie filling are all in pan. Melt 1/2 cup chocolate chips in the microwave. Set aside to cool. Beat cream cheese, butter, powdered sugar, and chocolate extract until smooth. Melt the last 1/2 cup of chocolate chips. Dip whole strawberries in and set aside to cool and harden. Grease bundt pan with a mixture of 1:1:1 mixture of oil, shortening, and flour. Let cake cool completely before removing from pan. Since I can’t physically send you this delicious Strawberry Rhubarb Bundt Cake, I’ll be sending one of you a brand new bundt pan so you can make it yourself! YUM!!! I have a bundt cake pan that I hardly use but I think it is time to break it out. Thanks for sharing, this looks delicious. I don’t have a bundt cake pan and I don’t know why. It’s time to get one (if I’m not lucky enough to win). That cake looks awesome.